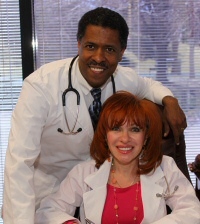 Since starting our practice over 15 years ago we have witnessed and documented many of the positive effects of hormone replacement therapy over the long term. We know that it is never too late to begin treatment and in doing so we can help you get back and keep the quality of life you expected to enjoy in your "Golden Years." For many patients, this doesn't mean that they are going to be able to start running marathons and climbing trees after their grandchildren, it simply means that they will be able to stay independent and out of the ER due to simple falls, long periods of inactivity and atrophy. In a recent study published in The Endocrine Society's Journal of Clinical Endocrinology & Metabolism, it was found the men, aged 65 years and older, with higher testosterone levels lost less muscle man than men with lower testosterone levels. Women tend to lose less strength and muscle than men as they age which suggested to the study's authors that there is a connection between testosterone, body composition and physical function. Erin Leblanc, MD, of Kaiser Permanente Northwest in Portland, OR and lead author of the study concluded by saying, "The amount of testosterone men have in their bodies may contribute to how much muscle and strength they lose as they get older. Our study adds evidence to the growing body of literature that suggest higher levels of endogenous testosterone may be favorable associated with some key components of healthy aging in men."